Galaxy Note 9 Case,WATACH Smart Clear View Makeup Mirror Electroplate Plating Kickstand Feature Full Body Protective Flip Folio Cover for Galaxy Note 9 (Blue) by WATACHE at Got Busted Mobile. MPN: ASX0185. Hurry! Limited time offer. Offer valid only while supplies last. 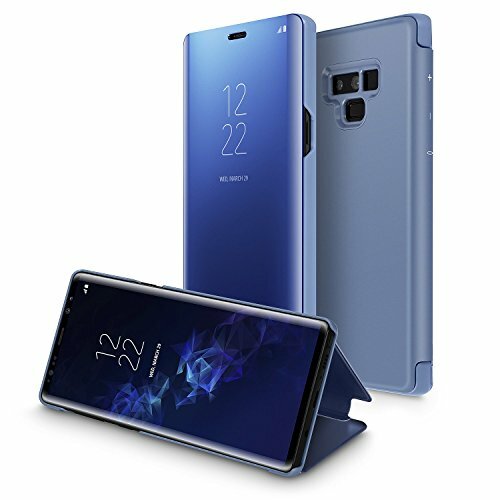 Compatible: Exact fit for Samsung Galaxy Note 9(2018 Release), work with most 3rd-party wireless chargers, screen protectors and other Galaxy Note 9 accessories. Kickstand Feature: Built-in kickstand that lets you make hands-free video calls, read, or watch movies anywhere comfortably. Clear Full Screen View: The Clear View Flip Cover enables you to view the date, time and weather through the display window directly. Electroplate Mirror Effect: Luxury Slim Mirror Flip Cover can be shiny plating makeup mirror, very convenient in daily used. Unique Design and Materials: The Electroplate Plating mirror case made of PC and PU leather,the front and back cover is PC, the connecting portion is premium PU leather.